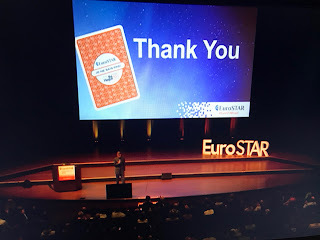 This year I attended my second EuroSTAR, in Haag, the Netherlands. Last one was 5 years ago in Gothenburg, so it was about time to re-visit this conference. The conference lasted 4 days, where the first 1,5 days were workshops, and 2,5 days of conference, talks and key notes - with a lot of social happenings and expo during the breaks. We were 5 in total from my company that attended the conference. First day I attended a whole day workshop with Michael Bolton, "Analysis for Testers", which was very educative and reminded me to keep looking at the big picture and context of what we are testing. There were a couple of assignments that we did in the classroom, in groups, and while they could appear to be easy and straight forward, they created quite a lot of debate among the participants. Even though all in all this workshop was educative and fun, there were some improvement points that I will suggest for Michael, like having more group assignments during the middle part of the workshop, spending less time on one of the analysis tasks "The testing manifesto", and not to rush through last part of the workshop (understandably as we were running out of time, so perhaps a bit better time management). After the full-day workshop, we decided to have a company dinner just the 5 of us, so we ended up trying some, presumably, local food and shared our impressions of the workshops we attended. 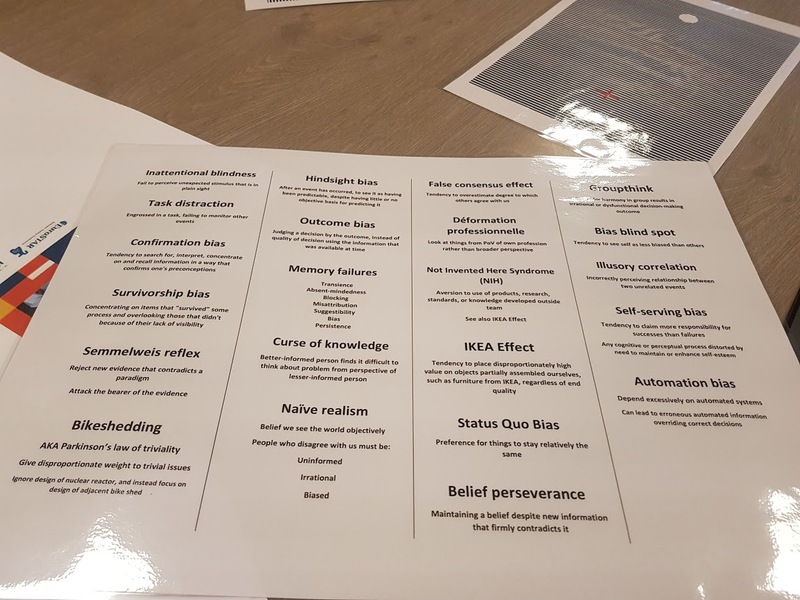 This day started with the half-day workshop with Dr. Andrew Brown on "Improve Your Sprint Retrospectives by Reducing Your Cognitive Biases". As I read some of Andrew's work earlier I knew what was to come in this course, and it was very interesting to dive a bit deeper into 3 of the biases, Hindsight bias, Survivorship bias, and Memory failure. We did different exercises trying to identify which biases we were susceptible to, and also did go through other types of biases, but unfortunately not much in depth due to time-constraints (this actually being a 2-3 day training compromised into half a day), before engaging into a bit of role-play from real-life scenarios based upon a team's work discussions and retrospectives. After the workshops, the conference chair Rikard Edgren kick-started the conference followed by the first key note. 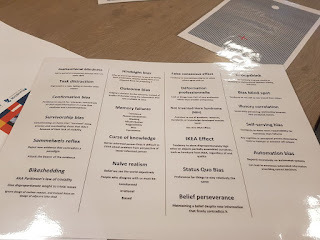 My focus and interest was mostly on hearing about what challenges and eventual solutions teams practicing Continuous Delivery and DevOps had, and how and where Artificial Intelligence / Machine Learning can be taken more advantage of, when it comes to software testing, so my choices of which presentation I attended were primarily driven by those two factors. Declan explained how the most significant test probably is not written by testers, the proof of work that checks and verifies new blocks on the blockchain. New technology comes with new risks, and how we testers should try to prepare for this. He also touched upon quantum computing and the P versus NP problem. My take aways from this talk was to invest more in contract based testing, to be able to check integrations earlier from both consumer and provider side. The pyramid needs to be reshaped, as we also need to add an inverted pyramid on top of the existing one, as we need to do more "post-deployment-verification", using monitoring and logging tools. During the breaks and lunch I usually switched between networking, meeting new people and striking a conversation or two with old acquaintances, and visiting the expo to get to know more about some of the tools and offerings from the vendors. I met a lot of colleagues from Norway and Sweden, but also made quite many new acquaintances. Wednesday kicked off with some lightning (strikes) talks from Alan Richardson, Seretta Gamba, Fran O’Hara, Isabel Evans and Michael Bolton before diving into the first key note. Rob shared recent experiences testing in the dark on chaotic turbulent projects turning his product ignorance into a testing superpower. Due to sickness there was a cancellation regarding the "testing in production" topic, but Karen stepped in and held an open discussion session where there were several discussions on what and how to test in production. Speakers gave us insights into how they at bol.com performed a transformation to DevOps on large scale, similar to what we in our company have done and are doing. I would say that this was most relateble talk for me due to the similarities in our apporaches. As they left the conference quite early I was not able to have a chat with them. Their approach was to make the teams fully responsible for their services, focus more on monitoring and test as much has possible in isolation. They also touched upon their approach to make the testers more technical in order to contribute more in devops. 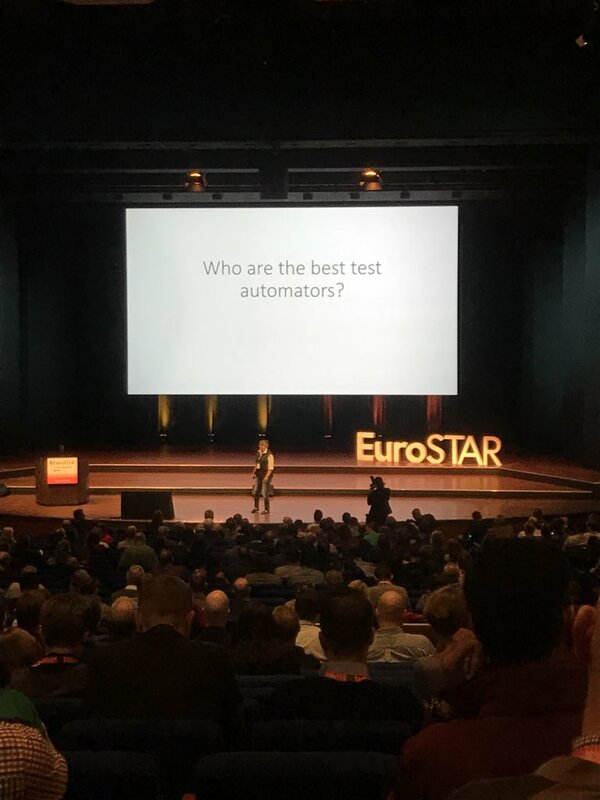 This talk did not reside well with me, as this talk was most about the test.io service as I understood it, and metrics used to reach some conclusion did not make sense to me, unfortunately. Sally talked about how diverse teams consistently outperform homogeneous teams - especially if the problems we are solving are tricky. Neurodiveristy at its best. 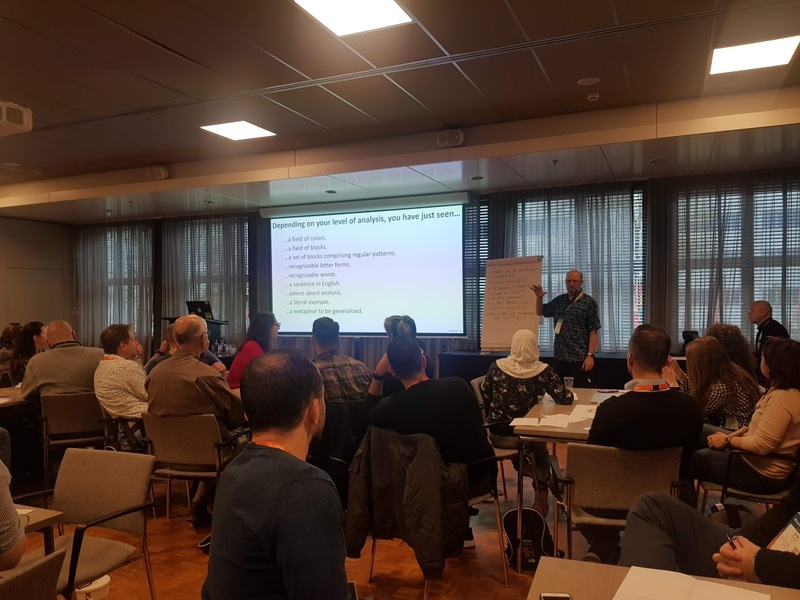 The day started with a fire at the conference venue, which meant that there was a need to re-shuffle some of the content, and the start was a bit delayed, but as we all were quite agile, and used to "plan to fail" principles, all went quite smoothly given the circumstances. Dragons of the unknown are lurking everywhere, and we as testers need to be brave enough to state "I do not know", especially when working with safety critical systems. Sometimes "I do not know" is the right answer. Adonis talked about how we went from reactive QA, through proactive QA, to predictive QA and possibly towards Cognitive QA in the future. Peter and Gerie talked about how AI and some of the ML algorithms were prone to bias, giving examples from the real world like the Amazon hiring algorithm, or Microsoft twitter bot. The conclusion was that we can not make intelligence from code, algorithms are thoughtless and the learning systems are what we train them to do. Karen made us question and think about what really was important for each and every one of us, through a series of questions and reflections of her own. The conference ended with some do-over sessions, from the best rated talks. I unfortunately was not able to attend those as I needed to go towards the airport, so I concluded this years EuroSTAR conference after the closing remarks, and lunch. All the sessions are available for download here. Most blogs on test automation are about how to add more and more tests to your automation suite, but rarely does anyone mention that you also should consider removing automated tests, especially those that do not provide any value. For a long time, at least over the last decades, testers have been implicitly considered to be responsible for testing the service that is developed. After each development cycle, which lasted many weeks and months, followed a cycle of testing, which lasted for some weeks, and then the service was released to production to the end-users. If the version happened to contain any serious bugs, testers were usually "blamed" for not discovering this during the test phases. But why was this a common (mis)understanding for a long time, and perhaps still is in some companies? Why are not developers blamed for introducing the bug in the first place, product owner for not being specific enough when explaining what the end-user wanted, or was it the end-user that was unclear in his or her description of the feature? 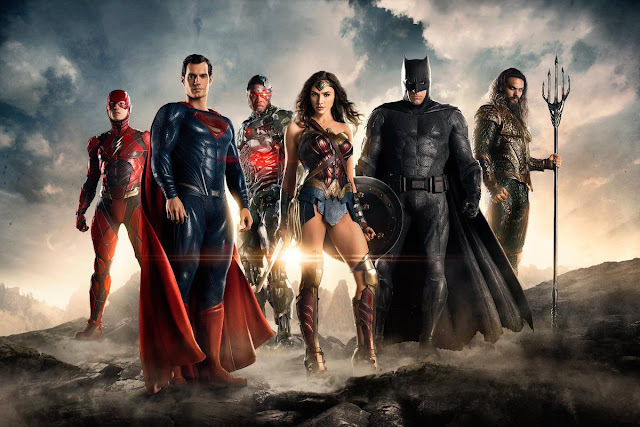 Why do we even bother pointing fingers on a specific role? Does the language we speak shape the way we think? This week I have been looking a bit into whether language(s) we speak, shape the way we think? Being raised up bi-lingual from the age of 8, where I spoke mostly Bosnian and Norwegian with a good addition of English, this is quite an interesting topic for me personally. Inspired by a talk from Lera Boroditsky from TEDWomen 2017, who had done a lot of experiments on this, here is what I found out. If you find this interesting, I encourage you to take a look at the presentation, many examples that I mention here are taken from her talk. 7000 languages, different way of thinking?